Frank Perry, percussion; Evan Parker, soprano saxophone (track 3); David Toop (track 4); Jin Hi Kim (track 4); Paul Lovens, percussion (track 5); Paul Lytton, percussion (track 5); Cathy Stevens, violin, viola (track 7); Chas. H Dickie, cello (track 7); Trevor Taylor, percussion (track 8). 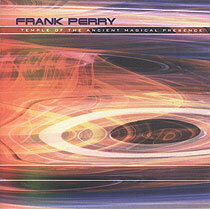 Temple of the ancient magical presence (12.00); recorded in 2000. Wedged into release (03.26); recorded in 1972 - Ovary Lodge out-take (solo). Corner shop meeting (11.18); recorded on 27 May 2000 at LMC Festival, London. Vegetarian please - was it them or was it me? (13.17); recorded in Aachen on 31 October 1980. Majestic (06.27); Ovary Lodge [Keith Tippett, piano; Roy Babbington, bass; Frank Perry, percussion] out-take from Ovary Lodge, 1972. Mountain mysteries (01.58); recorded 1990. Time for a quick one? (11.36); recorded in Westcliff-on-Sea, 1974. Track 3 is abbreviated; the whole piece was subsequently release on a limited edition LP by QBICO.